Are youstill putting enormous efforts to generate a descriptive flowchart in PowerPoint? No need to struggle more because iSlide has all the right options for you. All you have to do is sit back and enjoy an amazing flowchart in PowerPoint with custom templates. 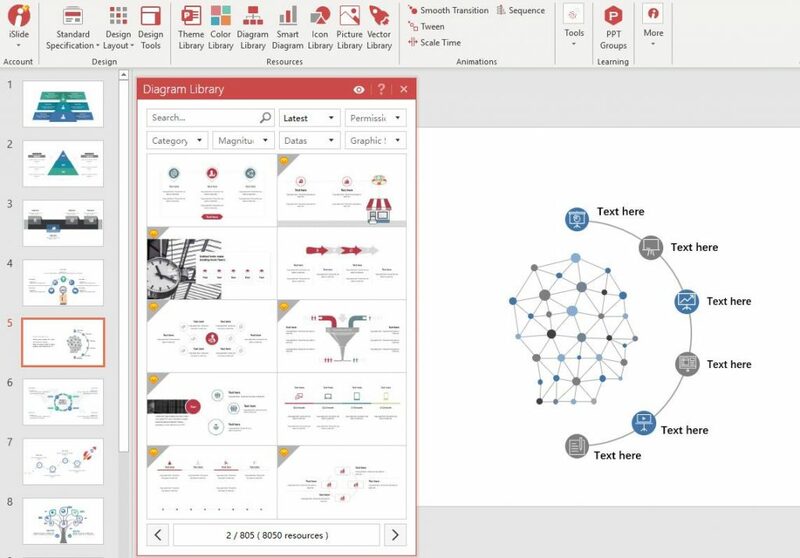 Curious to know that what iSlide offers you to design a stunning flowchart in PowerPoint? To satisfy your cravings, we are going toreveal all the admiring features of iSlide and its role to make a flowchart inPowerPoint with templates. It has some powerful tools that can surely help to enhance an ordinary flowchart to an extraordinary level. Do you know basic symbols importance while making a flowchart in PowerPoint? They are necessary ingredient if you want to proceed further. Keeping in view this extreme necessity, iSlide has come up with some unique symbols so that you could create an absolute magical flowchart and leave everyone mesmerizing. They are easy to use and no extra fee is required to buy them. Just download iSlide add-in and use these symbols free of cost. The Theme Library of the iSlide add-in is already ruling over hearts due to its distinctive features and characteristics. Now you will be glad to know that this incredible theme library is ready to asset you while making a flowchart in PowerPoint. These themes will bless your flowchart in PowerPoint with a unique and captivating look. You need to be clear about the exact idea of your flowchart and then pick up the right diagram from iSlide theme library to make a flowchart in PowerPoint. It offers a variety of themes including business themes, academic themes, technological themes, modern themes, scientific themes and a lot more. Beside of catchy symbols and descriptive themes, iSlide also offers amazing icons. These icons will definitely brighten up your flowchart. Although the iSlide is offering so many of them, you have to select that one which perfectly fits in your idea. Effective usage of icons while making a flowchart in PowerPoint will make you stand anywhere. So if you are bored of using the same themes and icons offered by PowerPoint in all your presentations than avail the option of iSlide. You will definitely not regret after taking an asset from an iSlide add-in icons like an icon of the boat, tech, book, laptop, business, tree,flower, traffic signals, warning sign and a lot more. We have seen so many people ruining their flowcharts in PowerPoint with an overdose ofdesigning. To make sure that you don’t commit this mistake, iSlide comes up with designing tools and moderate designing ideas for flowchart in PowerPoint.You just have to grab the ideas or use tools offered by iSlide and steal the spotlight with your incredibly beautiful flowcharts. You will enjoy an exciting ride while using design tools of iSlide like alignment, vectors, dock, sizefitting, animation and more. As you have discovered that iSlide is ready to say you a very warm welcome with assistance for flowchart in PowerPoint so what are you waiting for? Download iSlide add-in right now and enjoyfree of cost tools, facts, and figures!